I got my Block Buster products from LMCC! My birthday's Saturday! That's the night I'm bustin' blocks! Yeah! Quick question: the directions for the bath in the BB spell on the LMCC site say to pour water from the neck down -- I've noticed that other uncrossing baths start with pouring water over the head and working down... this was different. Is there a reason why only the neck down for this bath? Just wanna get this right. Thanks for any of your help! Placing fiery energy in your head or hair can be a bit much. You need a cool head for this work. Doc, I noticed that also. The ingredients are described as hot, fiery, and spiritually "explosive". So I thought that may be a reason why you would not pour it over your head. Yeah, angelael... it seems to me all the more reason to pour it over your head, especially if it's about busting mental and emotional blocks! Which is probably why I may be wrong. I thought it better to ask the experts in case there's a tradition-based reason. It may be the "purpose" of blockbusting I would think. After this bath it's best to dispose a cup of this at the crossroad ? Yes then go home, dont look back and do any work you have planned. how much days i need to take this bath ? 3,7 or 9 days ? It would depend on you and your situation. Any of the options you mentioned are good choices in general. That is also a great idea!! I do have the Blockbuster crystals here and I figured that I have to use them first before working on a petition to start the candle work but aren't the crystals only used in laundry and to cleanse the floors? No, Blockbuster Bath Crystals are not "only used in laundry and to cleanse the floors." They are called "bath crystals" because the most common use for them is to dissolve them in a bath. That is, to bathe with them. 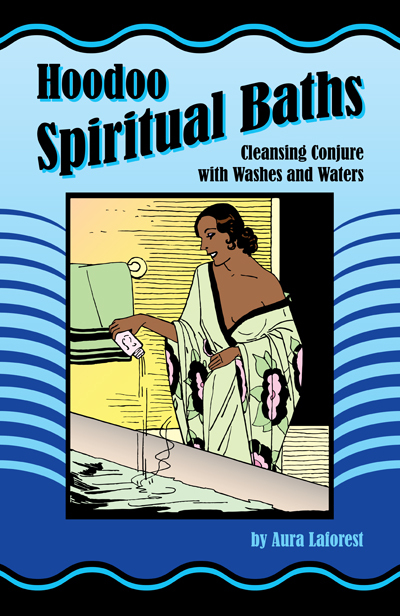 This book will help give you HUNDREDS of ideas on how to use both salt-based and herb-based baths, scrubs, teas, and washes. Thank You for that. I have ordered the book you just suggested and I did take the Block Buster bath today as the next few days coming I would have not been able to do any spellwork. I did pour the bath water with the crystals over my whole body & I didn't read the suggested readings in the bible all i ended up reading was the first Psalm as I ended up trying to find the sections with Solomon in it. Sadly I think I will have to do this again and I did also go to drink some of the prepared wash as well. Which way do I have to throw the remainder of this bath at the crossroads please? Hello Lovemydogs, which bath do you mean are you still speaking of the Block Buster? Yes I am speaking about the Block Buster bath crystals. The blockbuster is to remove obstacles to love, money, success, or luck. It doesn't draw in love. Like many people who come to this Forum, you have become limited in your understanding of hoodoo rather than broadened in it. There is no necessity to throw bath water to a crossroads. You do not "have to" do that and you do not "have to" do it in any certain direction. That's fine. Thank You so much for your help. 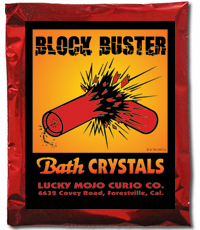 My order for Block Buster and Road Opener bath crystals just arrived from luck mojo today. I intend to use the Block Buster bath crystal to blow apart blockages or obstacles lied by anyone in my life, while I intend to use the Road Opener to open the door to a better future. You would take the blockbuster baths first. Then, the road opener afterwards. Take 2 baths with the road opener (each Monday). 1) Is there any specific hour or day to bath with it? 2) Do I need to dispose of the remnants of the bath water in a cross road? 3) Are the candles needed to be placed in any certain directions? 4) And what colours of candles should be appropriate? I am not Miss Aida, but i can reply to you. You are treating this as a rule-set, a series of actions that must be performed in a specified way at a specified time to get a specified result, like a video game or a sports contest or a laboratory procedure. Magic is not like that. It is an ART. There is no "right" way to paint a picture, no "correct" way to knit a shawl, no "one" way to cook a casserole, no "proper" way to take a photograph. There are popular ways and efficient ways, and ways that are traditional in a large culture of people, and these judgements as to popularity and efficiency and traditionality do come from the lived and shared experiences of many people, and they are passed along in forums such as this and via face-to-face and telephone conversations -- but so much depends on who you learned from and who they learned from. Music is also an art. There are so many styles of music in this world, and none of them is more "right" than others -- but here, in hoodoo, you are learning one form of -- well, let us call it music for a moment. We have given you the chords, the structure, some common verses to the piece. Now you want us to tell you the strict tempo and the key. But we decline. The key is going to be YOUR choice, to suit your inclinations and also your limitations. The tempo too is yours to choose. This is your part of the artistry of the work. But ... enough of metaphors. Here are some replies. They are not "answers" but "replies." 4) Orange is good for change, red is often used with Blockbuster as well, and white is the "universal" colour, good for everything. It is up to you to learn to work with this symbol-set of colours, if you choose to do so. If you are colour-blind (and many people are), just use white candles and black candles, as you wish -- white for good and black for evil. Reading through the forum I'm left still searching. As per blockbuster candle spell Do you pour water from neck down or from head down? Would you also inscribe on the candle wick to base, to remove obstacles? If you dispose of remains at cross roads as suggested, it's good practice not to look back, however in this spell it suggest to throw the remains in four directions which means you would end up throwing forward or looking back and then walking one of the directions you've thrown. Yes, top to bottom. Yes. As far as the four directions, If you walk East to South to West to North, I can't see how you would look back if you left at North. This is just an example of Directions to throw. But it really isn't that difficult.